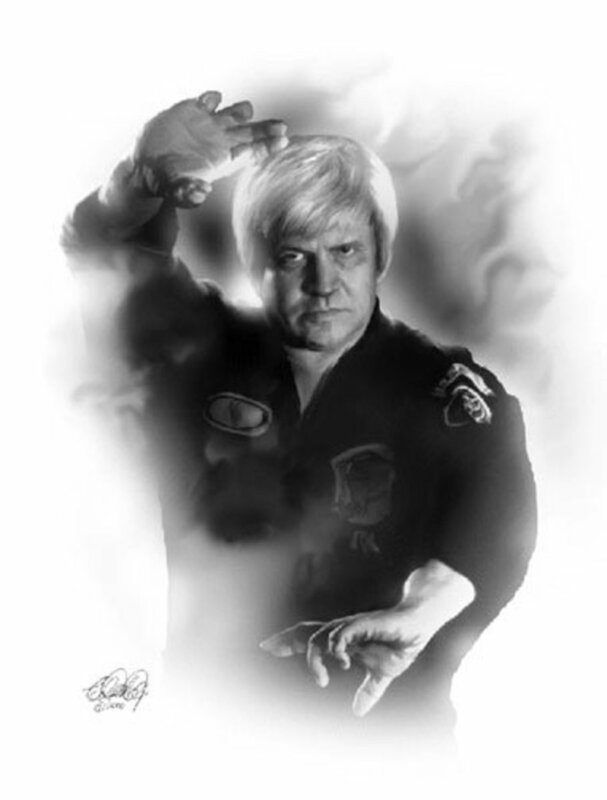 I enjoy practicing martial arts and love learning new techniques. The rear naked choke is a staple martial arts move, often seen during UFC fights and in martial arts classes around the world. Although it is known as a jiu jitsu move, lots of martial artists use it as it is a very useful choke. It is an easy way to submit your opponent, or render them unconscious if necessary. It is easy to do if you know how, so read this and learn the correct way so you can apply it with ease. You never know, it may save your life one day, or if not, then at least it could win you a fight if you're fighting for sport or defence. The good news is you don't need to be naked to perform this move. To apply the choke, the first thing to be is be behind the opponent. This is the rear bit, which is important. Presuming you're right handed, when behind them get your right arm around your opponents neck. The hand of your right arm then rests on the bicep of your left arm. The left arm then reaches to the back of their head, far enough down so they can't simply reach up and remove your hand. The next part is very important. As you push the head forward and down with the left arm, the bony part of your right forearm, which is the few inches closest to the wrist, needs to be pulled up and back into their neck, while you squeeze your right arm tightly to stop their head moving. If you do the two simultaneously, the choke is much stronger than just applying pressure to the back of the head. You can either apply the choke into the front of their throat, which stops them from breathing, or push their head forward and to the side with your forearm in to the side of the neck, while squeezing. This one cuts off the blood. Either work and if done tightly enough, either will stop both blood and breath. 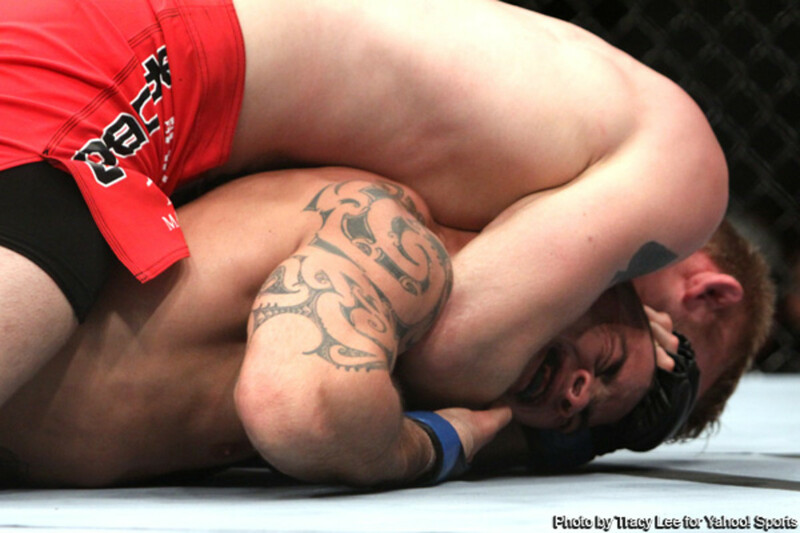 The choke, like any choke or submission attempt, won't work if your opponent can get free of it. You need to stop this from happening by limiting their movement. The choke can be performed with you on your back with them on top of you, both on your side, or you on top of them. Personally, I prefer to be on my back as I find it easiest way to control their movement, but everyone has their own preference. It can sometimes happen that you apply it on your back, but then they manage to roll to their side if they have a bit of fight in them. It won't last long as once the choke is applied then they will run out of juice very quickly. You need to get your legs wrapped around theirs if you're doing a standing or lying rear naked choke to stop them from moving away from you. If you are in position to do so, then your chest assisting in pushing their head forward lets you put on a strong choke with much less effort. It does depend on the position you're in, but if you can get on top or you're standing above them and can do this, then the choke is really easy to apply. Gracie rear naked choke. Tap or sleep. What you don't want to do is allow the person on the end of the choke any room to manouver their neck and take the pressure off. So don't let them tuck their chin down to stop your arm going under. If they move their chin down, then an easy way to pull their head back is to put the heel of your hand under their nose and pull their head up, or your finger in the top of their eye socket if necessary (exercise some caution with this one). How Long Before It Knocks You Out? When you're on the receiving end of the choke, not only are you unable to breathe, but it also compresses the arteries in the neck, which means blood can't circulate to and from the brain. Within seconds it KOs you and you have little choice but tap or go to sleep. If you are applying the choke, you must let go as soon as the opponent taps/passes out to avoid damaging their brain. The legs wrapped tightly round, mean that the man being choked can't throw the choker off him. A rear naked choke is fairly easy to set up. There are a few situations in which people almost put themselves into position and it is seems rude not to choke them. I'll go through a few of those now. The first is if you have managed to slip to the outside of their punch. 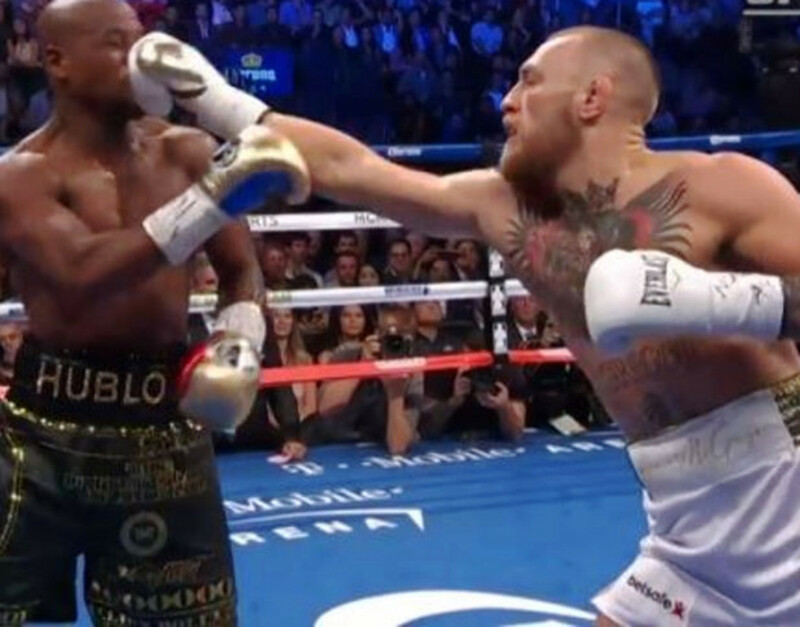 If you have managed to slip the punch, especially if you're moving forward at them, you can go over the top of their shoulder and wrap your arm round their neck. My preference as I am right handed is to wrap my right arm around. From there, to properly apply the choke, you're going to need to get them lower than you. If you're taller, or you've jumped on their back like the picture, no problem, just apply. If they're the same height, or taller than you there is a simple way of getting even a heavier opponent where you want them. Keep your body pressed tightly in to them and start a wave of forward motion from your shoulders down through your chest and stomach. When you get to the hips, a forward thrust with the hips forces their hips forward and as you're dragging back and down with their neck takes them off their feet. This is a simple technique that works even when you have a larger, resisting opponent. You will need to practice it obviously, but it works really well. From there walk take a step or two backwards, all the time keeping your back straight but putting them down, until they're on their backside and apply the choke. While applying the choke, keep tight to them to stop them from twisting and while your forearm is pulling up into their throat, push their head forwards and down with your other arm, reinforced by your chest. In seconds they'll either tap or pass out. The more they struggle, the quicker it will happen. When you're on your feet, there is another way of easily putting someone into the choke position. What you need to do is manipulate their shoulders. Lets say you want to apply the choke again with your right arm. Your right hand goes on the front of their left shoulder, while your left hand goes on the back of their left shoulder. Push forward with the right and down and across your chest with your left to spin them. The left pushing down is quite a forceful movement, which means that their shoulder is pushed down, which puts them off balance. While you're spinning them slide quickly to the left behind them. This one works well if as you've moved into them, you've given them a good punch in the stomach or solar plexus first, which makes the spin easier, although you can often just catch people off guard and do it. As they spin, as your hand was on their left shoulder then your right arm is automatically in position across the front of their neck. This is often unexpected and very fast once you've practiced it. It also works very well if you have a weapon like a knife or stick, as the point placed into either the back or the front of the shoulder helps as you're twisting them round. On the ground is where you often see the rear naked choke employed. Many UFC fights have ended this way. 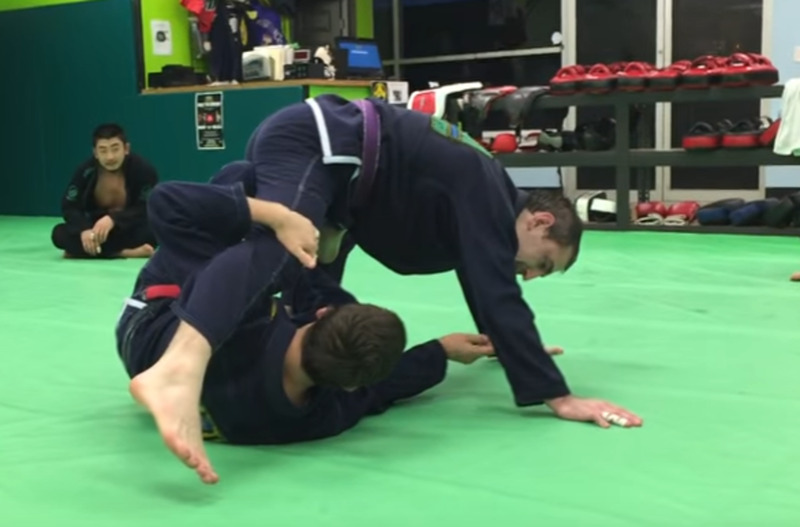 Obviously there isn't a way to tell you the perfect way of setting it up on the ground as rolling around makes the situation fluid, but one nice way of manipulating someones head into the position you want is by using the forearm against the back of the neck. If you get your forearm and lay it horizontally across their neck so you're pushing their head down, then push it down and right, then their body starts to turn. At the same time you're moving to your left to get behind them, which makes it easy to mount their back. You carry on the circular movement with your arm to slip it round the front of the neck into position. From here you need to make sure you wrap your legs around theirs, to ensure they can't slip out. You then apply the choke, using your left arm at the back of their head to push their head forwards, while the right pulls up and back into their throat. Another way of getting them to give you their back if they land on their back and you are above them is to keep tight and start throwing strikes down towards their face or chest. A natural reaction is to roll to the front to try to stand up when in that position. Of course them rolling onto their front is ideal for you, as you then have the opportunity to sink the choke. Keep your legs wrapped round, straighten them out as you sink in the choke and they will be unable to escape, whether they're face down with you on top, or face up with you on their back. 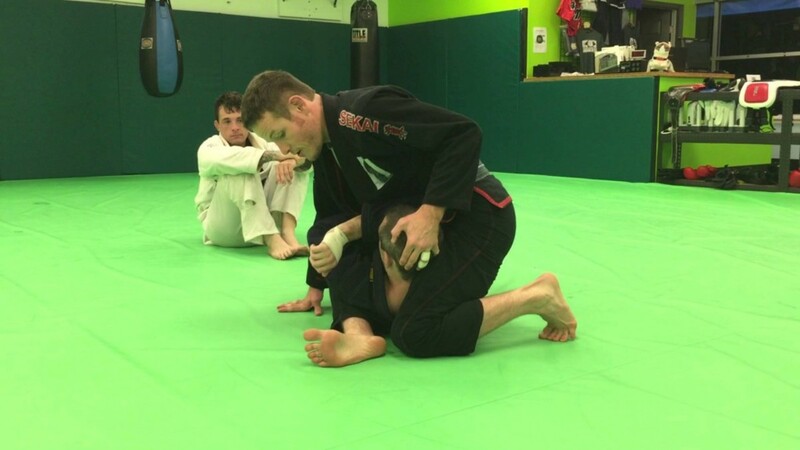 One thing that people often do to try and escape the choke before it has been properly applied and before you have got your legs round them, is roll. Well as long as you roll with them, this is actually advantageous to you as it gives you the perfect opportunity as you go over to land on your back and get your legs wrapped around their legs. As long as you're pinned on to the neck, they can roll all they like, sooner or later you'll be able to straighten them out and sink the choke. In fact when I've been grappling, sometimes when I'm pinned onto someone's neck, then I deliberately jump forward into a roll, to turn them where I want them. These are sloppy chokes, but the escape principle is sound as long as you do this quickly before the choke has been applied. How Do You Stop This Move? Once the rear naked choke is applied properly and your body/legs have been immobilised, it's nigh on impossible to escape from as unconsciousness comes so quickly. The way to stop it is to not let yourself get caught in it. This can be done while the opponent is getting their arms etc into position before it's been applied if you can tuck your chin in when the arm goes around your neck. If you're standing, then you can roll them forwards over your shoulders and throw them, or step back behind them as shown in the following video. Flesh grabs before it's been sunk in are also very effective, grab the skin and some of the muscle of the arm that has been wrapped around your neck, and pull it down and away from you as hard as possible. You must ensure you don't grab the whole biceps muscle as it won't work, but instead skin and some of the muscle so it separates when you pull. This is intensely painful and often enough to shock for a moment or two, which gives you the opportunity to escape by tucking your chin then slipping your head back and down while you lift their arm over your head, or possibly stepping back if you're standing. You must do it quickly, before it's expected and before the left arm has got into position, otherwise it won't work. It can also be possible to escape from a choke by performing a flesh grab on their inner thigh. This is a very painful place to be grabbed, I've beaten a stronger and larger opponent who caught me in a choke with his legs by flesh grabbing his inner thigh, as I yanked the skin, the shock caused him to loosen his grip momentarily, which allowed me to slip my head out and then mount his back. So don't write them off as useless, they can be very useful as long as used properly, which is in a painful place and done quickly. Essentially though, the way to stop being choked it is to not get caught in one and the way to not get caught is practice. With enough practice, you can feel when your opponent is going for it and you can move out of it before they get there. Practicing applying the choke is important too. When you practice, then you want to try and apply it using as much good technique and as little force as possible, with your training partner giving as much feedback as possible. Take it easy when practicing as it is easy to cause injury if you go full bore before you know what you're doing. If you can apply it well with good technique without forcing it at all, then when you need to do it you'll do it right and a bit more force will not harm. Well it won't harm you anyway. Perfecting the rear naked choke is a good addition to your grappling arsenal and can quickly neutralise a fight in seconds. How would you punch the knees if the hooks are very low? Punching the side of the knee only works if your not wearing gloves however because its the bone damage that affects you, the damage from htitting the side of their knee with a strong hook/power punch is enough to give them knee reconstruction. This is the perfect escape against a street fight rnc with HOOKS. If the hooks are in Punch the side of the knee with your knuckles. And the technique to escape is TURNING your head /jaw into their wrist, you must use the smile jaw technique which makes your cheek muscles stick out protecting your jaw 2 itimes more to withstand their arm pushing into you. Then double grabbing the forearm bone but hook your elbow around theirs for extra pull and pull it down (the arm behind the head. (they try and bite you.. break their jaw with the pulldown, the force of both your arms will rip their lower jaw. Pry your head backwards at the same time while you do this otherwise you wont escape it. Police Forces and Army forces teach this. I've not tried this myself but I heard pigs are good. I read this article and then went and tried the move out on my girlfriend. It worked. Now I just need an article on how best to dispose of a body. I didn't know that thanks for the share. Actually, to improve the effectiveness of the choke, it is better to breathe in and expand the chest. Absolutely :) I am also a fan of the kimura when the opportunity presents itself! Jeremygreen, I'm the same, I've done it so many times that I tend to fall into it without looking for it. I do go for other submissions when they're there, but the choke is guaranteed to finish the fight on the spot so it's a bit of a no brainer. I've had people submit even before I've even sank the choke in, but I guess when you're trapped, you know there's no getting away from it. One of my favorite moves to apply to my opponents!